There simply isn’t another social network with that kind of community and momentum for business professionals – buyers of business goods and services. With the proclamation of being “all in” on content marketing, LinkedIn serves as an opportunity for social media and content marketers alike. Of course where there’s content, there’s an opportunity to optimize as well. While most professionals are already on LinkedIn and see it as a jobs marketplace, many simply haven’t taken the time to optimize or maintain their profiles. They also haven’t discovered all the ways you can capitalize on LinkedIn as a marketing and social selling tool. The good news is that quite a few people have. 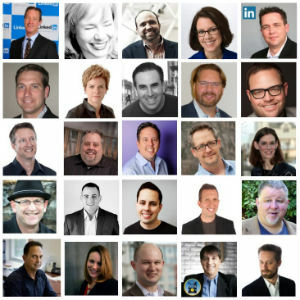 In the Sophisticated Marketer’s Guide to LinkedIn, there are 50 pages of advice directly from marketers within LinkedIn as well as some of the top B2B marketing pros in the business. There is also a list of 25 social media experts in the U.S. that LinkedIn suggests we get to know, selected by staff at LinkedIn. Many of the names on the list will be familiar to you and some will not. Regardless, this is the list that LinkedIn, the top business networking website in the world, published as recommended social media marketing experts. Congratulations to those on the list and congratulations to anyone who downloads AND reads the Sophisticated Marketer’s Guide to Linkedin. No list is perfect or comprehensive, so who would you add to this list? Great post; thanks for sharing your knowledge. I have downloaded the book and intend to link back. That’s great Tom, I hope you find the eBook useful. Good to see my buddy Doug Karr on the list. Well deserved. Doug is a good egg indeed. Thanks for pulling the post together and great job on the ebook! There’s no doubt that LinkedIn is the most powerful social media platform for business. I admire all these people in your list Lee. And I’m proud to say that I’m already connected to some of them. LinkedIn speaks the truth! This is an awesome list of thought leaders. This listed many of the top experts that I follow! But also a few others I definitely need to start watching 🙂 Downloading the ebook now. Good list — there are so many smart people to watch, and I’m glad that I figured out pretty early who some of the best are. Have been following about half on this list, including you Lee, for some time! Thanks for all the hard work and for sharing. Excellent list and thank you! Great list. Fortunate to have met some and worked with others. Good list, but I would not do much case recommendations, if I don’t know who makes it. You have to see more things, you’re posts, comments, etc… Since there are many trap in the recommendations. Thank you for the post.They look very influential individuals. There’s no hesitation in the thing that LinkedIn is the most influential social media podium for business. I myself have a high regard for all these people in your list.